Six people — including a Cantonment man — escaped serious injuries in a five-vehicle crash on I-10 in Pensacola Monday morning. The Florida Highway Patrol says Tara Orth, 20, of Pensacola, was entering I-10 eastbound at Scenic Highway when she lost control of her 2002 Toyota and traveled into the path of a 2009 Kenworth semi driven by Elwin Taylor, 42, of Dallas. Orth was transported to Sacred Heart Hospital with minor injuries; Taylor was not injured. While Orth’s vehicle was spinning across the interstate, it was hit by a 2000 Chevrolet van driven by Jocelyn Slayton, 42, of Pensacola. Slayton and her passenger, Jennifer Sartaguda, 36, of Pensacola, were both transported to Sacred Heart Hospital with minor injuries. The first semi hit a 2007 Kenworth semi driven by James Lassiter, 61, of Robertdale. Lassiter was not injured. Lassiter’s semi hit and dragged the vehicle driven by Slayton under its trailer. A 1991 Toyota driven by Russell Vick, 44, of Cantonment, was hit by Orth’s vehicle, sending Vick into a guardrail. He suffered minor injuries and was transported to Baptist Hospital. Orth, the driver that lost control while entering the interstate, was charged with careless driving, according to the Florida Highway Patrol. 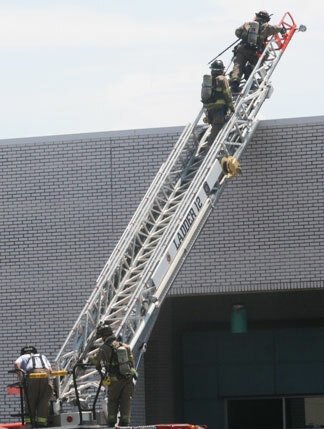 Three Escambia County Fire Rescue firefighters were injured Monday morning when they received an electrical shock while investigating a fire alarm at a Pensacola business. 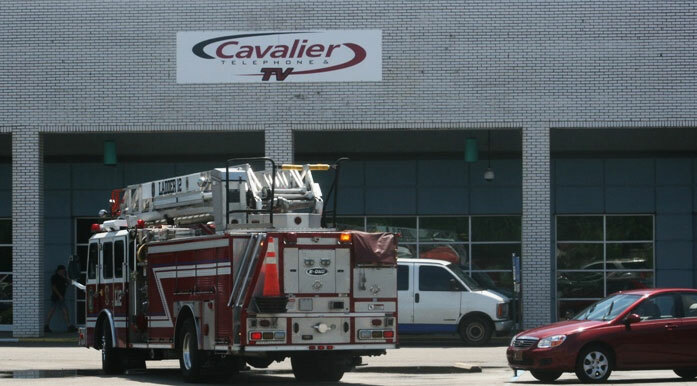 The incident happend about 10:30 this morning at Cavalier Telephone on North Pace Boulevard in the old Town & Country Shopping Center. Fire crews had responded to a fire alarm at the building and during their investigation discovered smoke in the basement of the building. Three firefighters received an electrical shock from an unknown source as they entered a basement room. The three were treated at the scene and transported by ambulance to Baptist Hospital. Their injuries were not life threatening. 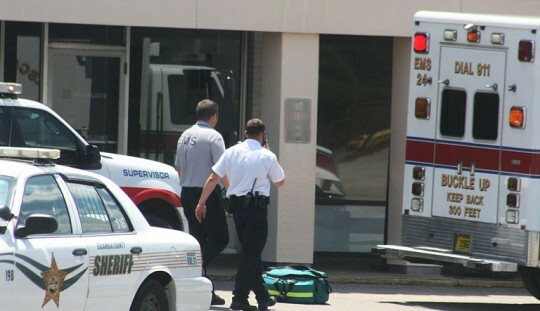 The Ensley, Oceola and West Pensacola stations of Escambia Fire Recue responded to the call, along with Escambia County EMS and the Escambia County Sheriff’s Office. Pictured. Three Escambia County firefighters were injured while investigating a fire alarm at Cavalier Telephone in Pensacola Monday morning. NorthEscambia.com photos by Kristi Smith, click to enlarge. Ms. Annette Lambeth Griffis, 48, passed away on Saturday, May 29, 2010 at a Pensacola, FL hospital. Ms. Griffis was a native of Bogia, FL, a former resident of Century, FL for most of her life, a resident of McDavid, FL and attended the Pentacostal Church. She was preceded in death by her Father, J.D. Griffis, a Brother, Joseph Wayne Griffis, a Nephew, David Griffis, Brother-in-law, Kenneth Hanks, and a Sister-in-law, Mary Griffis. Survivors include: a Son, Cody Lambeth of Atmore, AL; her Mother, Ruby Griffis of McDavid, FL; four Brothers, Danny Griffis, Gary Griffis, Dennis Griffis and Tony Griffis, all of McDavid, FL; two Sisters, Patsy Griffis of McDavid, FL and Brenda Hanks of Century, FL; and a Number of Nieces and Nephews. Funeral services will be held Thursday, June 3, 2010 at 2:00 P.M. at the Petty-Eastside Chapel Funeral Home with the Rev. Richard Daniels officiating. Visitation will be held Wednesday, June 2, 2010 between 6:00 and 9:00 P.M. at the Petty-Eastside Chapel Funeral Home. Pallbearers will be Johnny Griffis, Terry Capps, Chad Hanks, Rusty Bagwell, Jackie Johnson, and Mark Hennington. Honorary pallbearers will be Johnny Johnson, Jeff Johnson, Tony Griffis, Dennis Griffis, and Gary Griffis. Randy Keisler’s debut for the Pelicans was a start he would like to forget as the Captains (8-8) banged out seven runs off nine hits off the lefty in rout to a 14-4 victory over the Pelicans (6-10) Sunday. Shreveport-Bossier struck first in the first inning when Jorge Alvarez hit a two out chopper that snuck through the infield and into left field which scored Bryan Sabatella to give the Captains an early 1-0 lead. A nightmare hit the Pelicans in the second inning as the Captains banged out 6 runs in the inning. The inning started with back to back walks thrown from Keisler. A bunt was put down from Brian Peterson down the third base line where the ball bounced out of Brito’s glove from a throw from Dallas Christison and helped bring in Palmer Karr Jr. to make it 2-0. Uriak Marquez singled in Adres Rodriguez to make it 3-0. Bryan Sabatella then doubled to deep right centerfield to score Peterson to give the Captains a 4-0 lead. One out later, the bleeding wouldn’t stop there as Christopher Garcia rifled a single to right to bring in Marquez and Sabatella to make it 6-0. Alvarez would follow with a RBI blooping single into right center to score Garcia and make it 7-0. The Pelicans would battle back in the fourth inning when Chase Porch singled to left with the bases loaded to score Javier Brito and John Alonso and cut the deficit to five 7-2. One out later, Francisco Leandro hit a bouncing into right field to score Palmisano from second base to make it 7-3. The Captains would tack on two more runs in the sixth inning off Kevin Johnson to make it 9-3 with six innings in the books. In the seventh inning, the Captains would reach the double digit mark when Uriak Marquez lined a double to left centerfield over the outstretched glove of Porch to score Andres Rodriguez to make it 10-3. Later in the inning with the bases loaded and nobody out, Jovanny Rosario lined a single to right field which scored Peterson and Marquez to make it 12-3. Garcia then shot a single to left field to score two more runs to make it 14-3. In the 8th inning for the Pelicans, Palmisano hit a sharp single to center to score Rodriguez to make it 14-4. Osvaldo Rodriguez (4-0) gets the win as he gave up three runs off four hits through five innings pitched. Randy Keisler (0-1) gets the loss as he gave up seven runs-five earned off nine hits and struck out five through five innings pitched. A 48-year old woman found face down in the Escambia River Friday morning has passed away. The victim was identified by the Escambia County Sheriff’s Office as Sharon Annette Lambeth, 48, of Gunner Road, McDavid. According to the Sheriff’s Office incident report, Lambeth was one of two passengers in a truck driven to the end of Gunner Road, which ends at the Escambia River. She told the vehicle’s male driver that she was going to walk toward the water. About three minutes later, the driver began to look for Lambeth, but could not see her so he walked to the edge of an embankment about 10 to 12 feet above the river, according to deputies. The man found the victim face down in the water. The man told deputies that he jumped into the river, pulled the victim out and began to perform CPR. After performing CPR for some period of time, the man placed the victim in the truck and drove to a nearby home and yelled for the residents to call 911. The man continued to perform CPR until emergency personnel arrived on scene. Lambeth was transported to West Florida Hospital by LifeFlight following the incident. According to the Sheriff’s Office report, the man told deputies that Lambeth was unable to swim and had been drinking vodka prior to the incident. Editor’s note: The Escambia County Sheriff’s Office report identifies the victim as Sharon Annette Lambeth. Her obituary (click here) identifies her as Annette Lambeth Griffis. Pictured above: The victim is loaded into an ambulance at a home on Gunner Road. 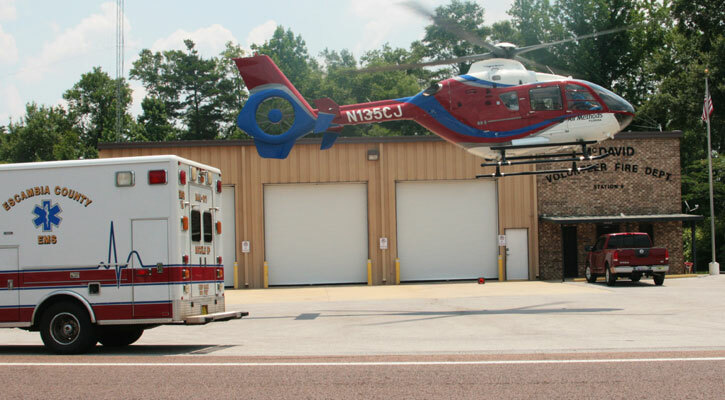 Pictured below: LifeFlight lefts off with the victim from the McDavid Fire Station. NorthEscambia.com photos, click to enlarge. A local man was arrested for DUI after a wreck Sunday night on Highway 97 in Walnut Hill. Dusty D. Mason, 24, of Still Road, Century, was taken into custody by the Florida Highway Patrol following the 8:30 p.m. wreck on Highway 97 just north of Tungoil Road. Mason was northbound on Highway 97 when he ran off the roadway, struck a power pole, continued north in the ditch and went over a driveway, with his Chevrolet coming to rest back on the edge of Highway 97. Mason refused medical treatment following the crash. The power pole that Mason struck was broken about 12 feet off the ground. Residents in the area did not lose power immediately after the crash. 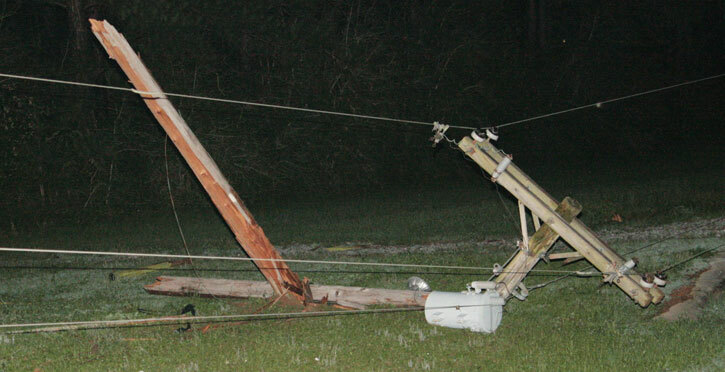 But an unknown number of Escambia River Electric Cooperative customers south of Howell Road lost power about 9:40 p.m. as the power company worked to replace the broken pole. 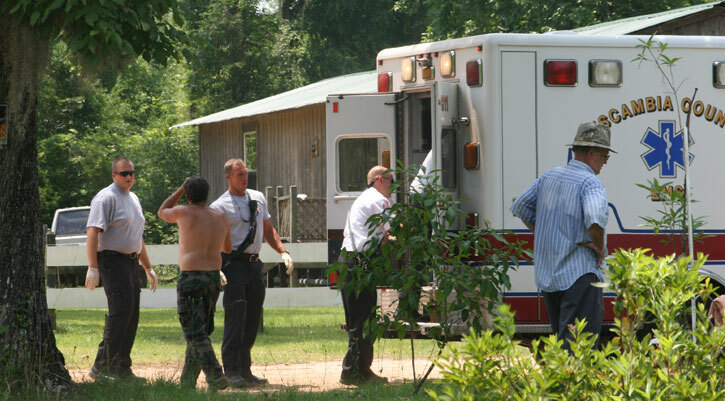 The Walnut Hill Station of Escambia Fire Rescue responded to the call. Pictured top: The driver of this vehicle was arrested for DUI following a Sunday night crash on Highway 97. 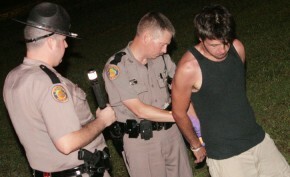 Pictured top inset: Dusty Mason, 24, is taken into custody by the Florida Highway Patrol after the accident. Pictured below: A power pole was broken in the crash. 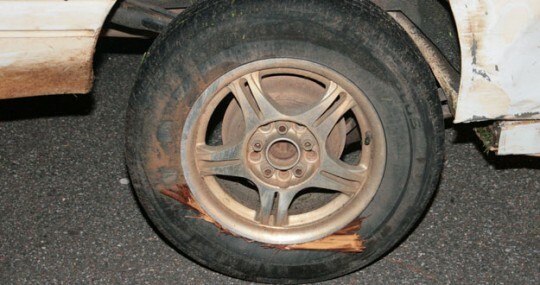 Pictured below: A portion of the power pole was lodged between a tire and rim in the accident. NorthEscambia.com photos, click to enlarge. Your Memorial Day could be a wet, stormy one. Just like Saturday and Sunday, thunderstorms are expected to bring heavy rain and lots of lightning both today and Tuesday. With saturated ground from weekend storms, some areas could see isolated flooding. Memorial Day: Showers and thunderstorms likely. Mostly cloudy, with a high near 85. Calm wind becoming south southwest between 5 and 10 mph. Chance of precipitation is 60%. Monday Night: A 40 percent chance of showers and thunderstorms. Mostly cloudy, with a low around 68. South southwest wind around 5 mph becoming calm. Tuesday: Showers and thunderstorms likely. Mostly cloudy, with a high near 86. South wind between 5 and 10 mph. Chance of precipitation is 60%. Tuesday Night: A 20 percent chance of showers and thunderstorms before 1am. Mostly cloudy, with a low around 68. Southwest wind around 5 mph becoming calm. Wednesday: A 40 percent chance of showers and thunderstorms. Mostly cloudy, with a high near 91. Calm wind becoming south southwest between 5 and 10 mph. Wednesday Night: A 20 percent chance of showers and thunderstorms before 1am. Mostly cloudy, with a low around 70. South southwest wind around 5 mph becoming calm. Thursday: A 40 percent chance of showers and thunderstorms. Mostly cloudy, with a high near 90. Calm wind becoming south southwest between 10 and 15 mph. Thursday Night: A 30 percent chance of showers and thunderstorms. Mostly cloudy, with a low around 69. West southwest wind between 5 and 10 mph. Friday: A 30 percent chance of showers and thunderstorms. Mostly cloudy, with a high near 92. Friday Night: Mostly cloudy, with a low around 68. Saturday: Mostly sunny, with a high near 95. People across North Escambia and the country paused Monday to remember the brave men and women that have served our country today as we celebrated Memorial Day. The largest such memorial in the North Escambia area, the Veteran’s Honor Wall has stood in front of the Walnut Hill Community Center since its dedication in 2003. There are about 300 names on the wall, including 13 names of soldiers killed in action. The wall honors those from the Walnut Hill area that have served in the nation’s military. The Walnut Hill Veterans Wall is located in front of the Walnut Hill Community Center at 7850 Highway 97. About 30 of those that served from the Century area are honored on the Century Veteran’s Wall of Honor at Century’s Roadside Park on Highway 29. The Wall of Honor inside the Barrineau Park Community Center honors over 100 people that have served in the military. The wall was a project of the Barrineau Park Historical Society. 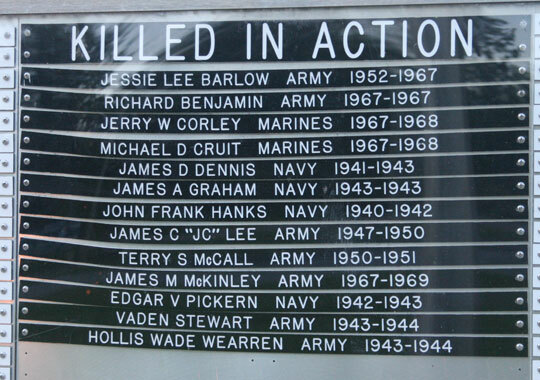 Pictured above: The names of those killed in action on the Walnut Hill Veterans Wall. Pictured below: The Wall of Honor inside the Barrineau Park Community Center. NorthEsambia.com file photos, click to enlarge. Travel was a little more expensive this Memorial Day weekend than last year, with gas prices in the North Escambia area up about 35 cents. According to the AAA Fuel Gage Report, the average cost of a gallon of regular unleaded is $2.65, up from $2.39 a year ago. In North Escambia, that gallon of gas was at about $2.69, up from $2.34 last year. Two years ago, the average price was $3.91 a gallon. Pictured: Regular unleaded was at $2.69 a gallon Memorial Day weekend at the Tom Thumb in Molino. NorthEscambia.com photo, click to enlarge. There will be no change in ECUA garbage collections, with North Escambia pickups as usual on Tuesday.